US equity markets closed higher on Friday, setting new records, with the Dow Jones up 0.85% at 26,616 and the S&P 500 up 1.18% at 2,872 – the largest one day move in 10 months, with the healthcare and tech sectors the driving force. The Nasdaq composite surged 1.28% higher to close at 7,505. January is shaping up to be the best month in over two years for the US, largely on the back of strong corporate earnings. US dollar weakness has also continued to help the exporters and the multi-nationals. The US dollar index hit a three-year low on Friday at 89.062. Precious metal prices and commodities also had strong gains. One has to wonder about the US dollar and why it has been so weak given the robust performance of the US economy and the corporate sector. Or is it more about the rally in other currencies such as the euro, yen and Aussie dollar, which are also rebounding from the heavily oversold levels of a year ago? 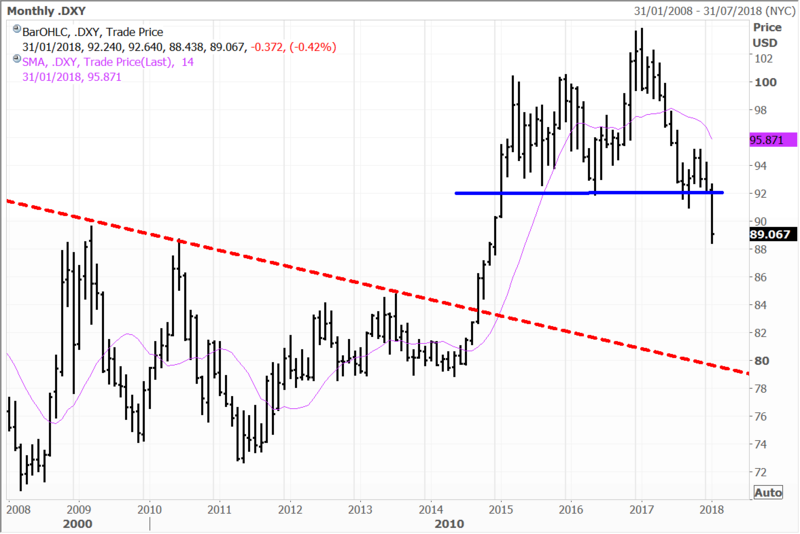 Since the breakout in late 2014, the Dollar Index has surged to nearly 110, but over the last three years the key 92 support level has been tested on numerous occasions. The breakdown below support occurred last week with the selloff in the US dollar being remarkably swift. This move has perplexed many traders with the Federal Reserve leading the major central banks in terms of tightening. Australia, Japan and Europe are far behind in terms of their cycles, so the question is how much further can the US dollar go on the downside? I think the low point cannot to be too far away and I fully expect the greenback to put up a fight at 89. I could be completely wrong, but we might just be seeing “peak dollar weakness” now. AbbVie was the top performing S&P 500 stock on Friday with it rallying 13.8% while Intel was in second place with a 10.6% jump after reporting very strong numbers. The conglomerate Honeywell also issued positive quarterly results. In Australia the market was closed on Friday for Australia day. The index ran into the public holiday on a soft note with the ASX200 edging 4 points lower to 6050. The resources sector though was notably higher, while gold stocks were also strong. Buoyancy in global markets on Friday though has the Australian market poised for some catch-up today. The SPI futures are pointing towards a gain of 30 points. The ‘Steve Mnuchin’ inspired weakness in the US dollar last week has underpinned further robust gains in the commodities markets, and not surprisingly support for the mining sector. This was in evidence on Thursday in Australia with Rio rising by 0.78%, and BHP ahead by 0.55%. South32, which has performed well for us for some time in the portfolios, edged 2.6% higher. Steve Wynn became the latest casualty of “Harvey-gate” after Wynn Resorts lost around 10% on the back of alleged misconduct by its founder. The Board of Wynn Resorts said it held a meeting and it will form a special committee, consisting of independent directors, to investigate the allegations. Mr Wynn described claims reported in the Wall Street Journal as “preposterous” and rejected outright the statements made against him. We hold Wynn Resorts in the Global Opportunities Managed account portfolio, and Wynn Macau in the Global Contrarian Fund. 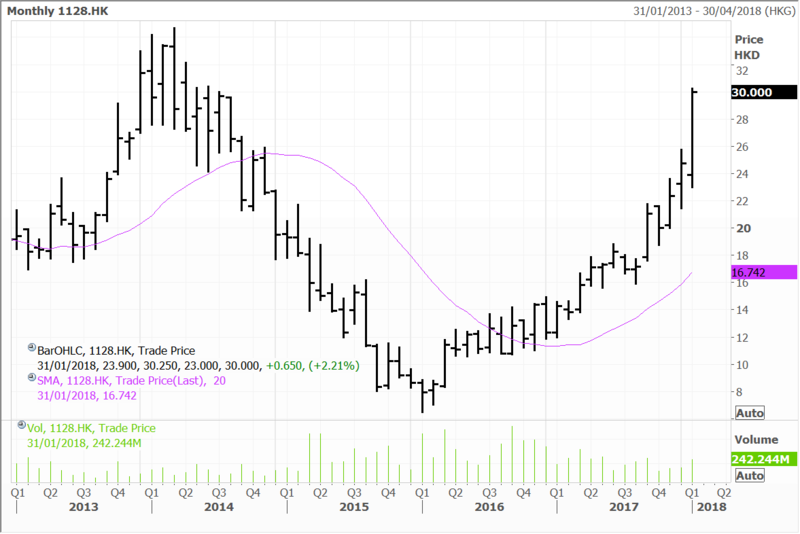 Wynn Macau will be in for some weakness as well when the Hong Kong Market opens later today, but I would see this as a buying opportunity. Wynn Macau is planning to expand its newest property on the Cotai Strip after the project helped the company report better-than-expected earnings last quarter. Wynn Resorts’ shares are still up strongly for the quarter, by 25% and almost 89% over the past year. Prior to Friday’s stumble, the shares had rallied in the wake of a strong fourth quarter report. Revenue in the fourth quarter of 2017 surged almost 30% year-on-year to $1.69 billion, as a strong contribution from Wynn Palace more than offset modestly lower revenues in Las Vegas. Adjusted property EBITDA (earnings before interest, tax, depreciation and amortisation) came in at $480.2 million, up 41% year-on-year. Again, this was primarily due to the contribution from Wynn Palace, although the other Macau property also chipped in with a stronger result. That Chinese spending on luxury goods rebounded to an estimated 12% growth rate in 2017 highlights the growing strength and breadth of the premium mass market in China. Besides the likes of luxury goods retailers, this is a benefit for the Macau casino operators. I have often written in the Daily that with its status as a special administrative region of China and its proximity, outward bound tourism to Macau has a healthy future. MGM China, Sands China and Wynn Macau are all holdings in the Global Contrarian Fund, along with the Global Opportunities and Asian Managed Account portfolios. They have all performed strongly over the past year. Trading in the stocks was mixed in Friday, with MGM China gaining 2.8% as it nears the opening of its new Casino on the Cotai Strip this week. Wynn Macau shares gained 2.2%, while Sands China shares slipped 0.4%. As noted above, Wynn Macau shares might feel some pressure in trading today due to the breaking news on Friday regarding Steve Wynn. Shares of Baidu trading on the Nasdaq lifted 2.4% on Friday. Last week Baidu President Ya-Qin Zhang hinted at “a lot more exciting deals” to come in the video streaming space this year, according to CNBC reporting. Its Chinese video streaming business iQiyi is a leader in the space in China and last year inked a deal with Netflix to bring some of its content to the mainland Chinese audience. CNBC quoted Mr Zhang as saying, “Original content is becoming a critical differentiator for iQiyi and we will continue to invest in that.” Baidu is a holding in the Global Contrarian Fund, the Global Opportunities and Asian Managed Account portfolios. Disclosure: The Fat Prophets Global Contrarian Fund declares a holding in: Wynn Macau, Sands China, MGM China, BHP, South32 and Baidu.